Facebook has been caught in the past trying to gather intel on the public it serves. 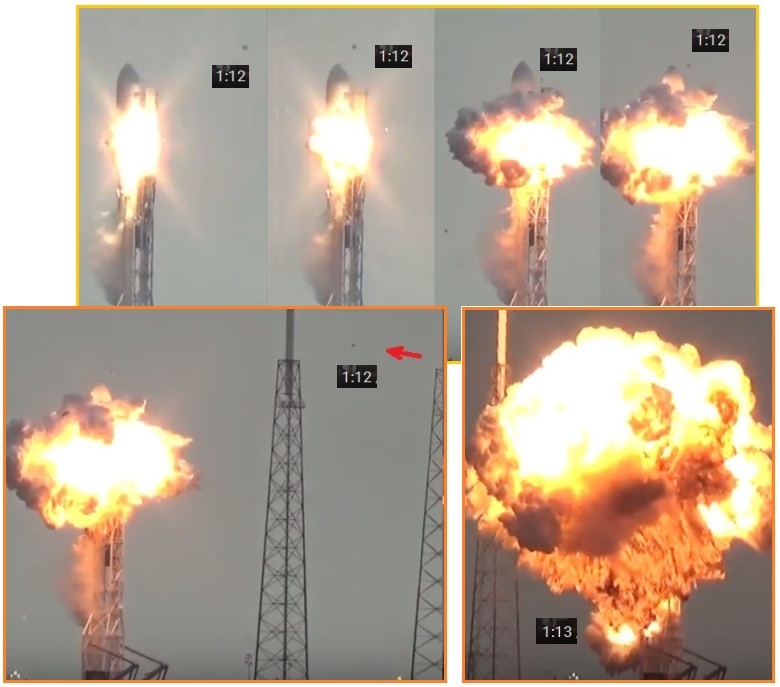 In 2016 a Space X missile was shot down upon launch by UFO’s because it was delivering a FaceBook satellite that was designed to spy on survival sites in Africa. The UFO’s were caught on film. Per the Zetas, this was a pointed warning to FaceBook and Israel, its partner, that collecting intel on remote African survival sites was not going to be allowed. The loss of the satellite and launch cost Facebook $200 million and Space X an estimated $390 million. ZetaTalk Comment 9/03/2016: FaceBook is immensely popular and international, and Zuckerberg had announced almost a year ago that he intended to promote his internet.org via satellites and drones, to provide service to parts of the world with scarce access to the internet. As the satellites fail, these will be replaced with the Zuckerberg drones already in operation. All communications in the vast region of Africa will be known to Zuckerberg and his elite allies, who obviously include Israel. This information would be used for enslavement and control, and it is this effort that the Council of Worlds will not allow. In 2017 FaceBook was again caught trying to gather intel via Disaster Maps, which track where survivors of disasters migrate. Once again, this was under the guise of helping the people, but per the Zetas, his goals were anything but that. He and his partner, Israel, were hoping to arrange slave labor camps from the desperate survivors. ZetaTalk Comment 6/17/2017: The Council of Worlds slapped Zuckerberg down in 2016 over his ambitions to control survivors in Africa with his drone based Internet. He is now trying to be covert. His cover is to masquerade as an assist to disaster recovery providers. Zukerberg is hardly a humanitarian. As a member of the elite he wishes to limit and control the starving masses after the Pole Shift, to enslave them, and to eliminate those who will not be useful to he and his ilk. He seeks information. True karma awaits. Now in 2018 FaceBook is back in the news, with another accusation that they are collecting info on the public for nefarious reasons. Congressional hearings resulted. This emerged for two reasons: Cambridge Analytica, a data mining company, was given access to the personal data of 87 million FaceBook users in order to gage political trends and conservative bloggers Diamond and Silk, who have 1.2 million followers, were closed down because they were deemed “unsafe to the community”. Per the Zetas, Zuckerberg’s apologies and promises will not be enough. ZetaTalk Comment 4/30/2018: Is there more to the FaceBook brouhaha than data security and data mining for political purposes? Certainly, in Washington DC, it is the season for campaign accusations, with Special Investigator Mueller investigating the Trump Campaign for Russian collusion and Hillary’s funding of the Russian Dossier not even needing an investigation to show her Russian collusion. Zuckerberg allowed Cambridge Analytica to examine FaceBook trends, reportedly to assist the Trump campaign. If private data could be harvested for such examinations, what other mischief might be going on? Given that this is Zuckerberg’s goal, can he be stopped by hearings in Congress? To the extent that the elite make their plans among themselves, the Council of Worlds will not interfere, as the Rule of Non-Interference allows young souls to explore their options and learn by making choices and making mistakes. But the Council has made it clear, by taking down any satellites that seeks to track migration that it will not tolerate this. Beyond satellite outage, what can be done? The Transformation Team, which includes General Dunford, can limit the use of private data by Zuckerberg and others by engaging Congress and the White House, limiting these practices, by law. 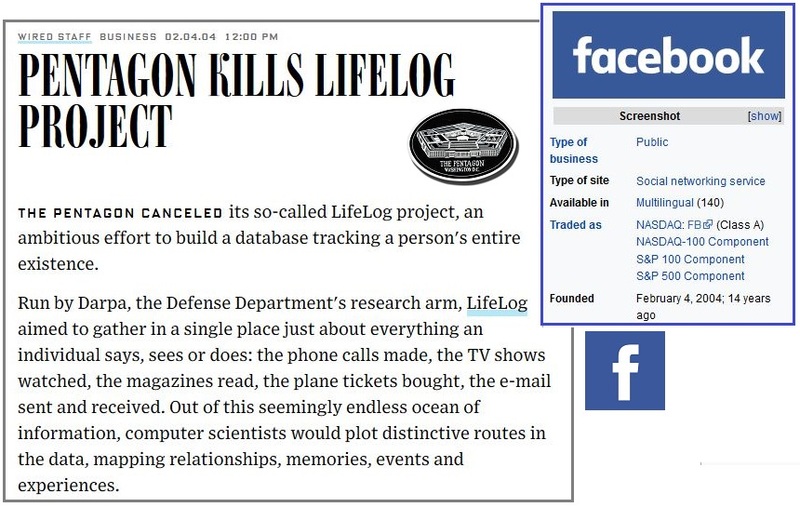 The Zetas posed the question about a central database holding users of social media and Internet shopping selections, and this appears to be answered by a Q Anon researcher who discovered this remarkable coincidence: The Pentagon’s LifeLong project was closed and killed on the very same day, February 4, 2004, that FaceBook was founded. Coincidence? Or was the Pentagon operation under President Bush folding its collection of personal data into a database to be built by FaceBook and Google and Twitter and other social media giants? What was Senator John McCain doing in Syria the day before the April 7 gas attack on Syrian citizens? He was delivering Nitrous Oxide, laughing gas for his wife’s charity – Operation Smile. The gas attack happened in rebel held territory, the anti-Assad rebels McCain was known to support. Could there be a connection? Without a doubt. A similar trip to Syria happened last February, just days ahead of another gas attack, also in rebel held territory - Eastern Ghouta. McCain is a war hawk, part of the Deep State being drained at present by Trump and his Junta. He was recently under House Arrest, but was released, per the Zetas, to lead the authorities to his contacts in Syria. These nests of McCain backed rebels were the sites bombed by the US coalition on April 14. There is, of course, no tactical advantage for Syrian President Assad to be gassing his own people when he's already back in control of 98% of his country and when President Trump had just announced the upcoming troop exit from Syria. "By all means, let's perpetrate a mass killing of our own people to make the Americans turn around and come back," is the self-evident irony of the situation. Everybody knows that McCain's ISIS boys have their hands all over the Syria chemical attack, whether that be real or staged. But it gets worse. It's not just McCain's ISIS boys who have their hands all over Syrian chemical weapons. 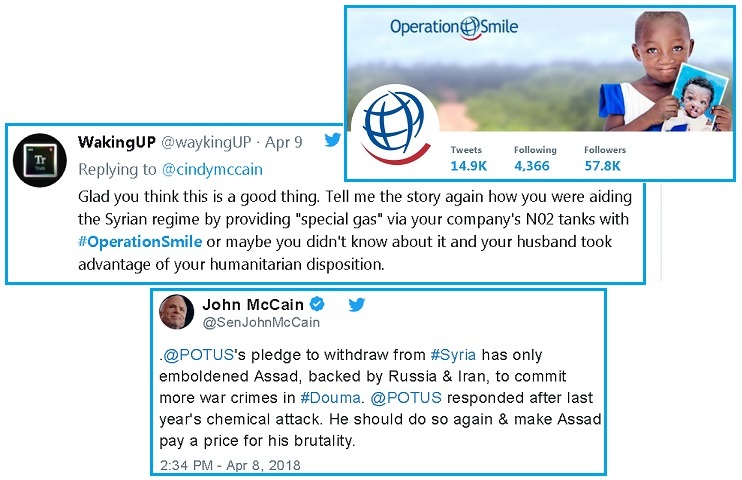 McCain's wife, Cindy, might also be unwittingly involved in a chemical weapons smuggling operation via a charity organization on which she sits as a board member: Operation Smile. Activists and aid groups say that dozens died in Saturday's airborne assault on Douma, the last rebel stronghold in eastern Ghouta, which has been subjected to intensive bombing by Syria's Russian-backed Assad regime. More than 500 people, including women and children, have died in Eastern Ghouta. Witnesses reported smelling the gas after an explosion in the rebel-held area of Eastern Ghouta. ZetaTalk Comment 1/31/2018: Clear signs that both Hillary and McCain were under House Arrest due to their ankle bracelet boots, where McCain even switched his boot to the wrong foot for a press interview, being forgetful and senile. Just a week after the chemical attack in rebel held territory of Syria, the US, along with France and Britain, bombed sites in Syria suspected of holding chemical weapons or manufacturing these weapons. Per reports, 71 of 103 missiles fired were intercepted by anti-missile missiles. Per reports, Russia was forewarned and moved their ships away, and Syria was forewarned so moved their planes away. Per the Zetas, blaming Syria was agreed, and McCain’s involvement was also not publicized. 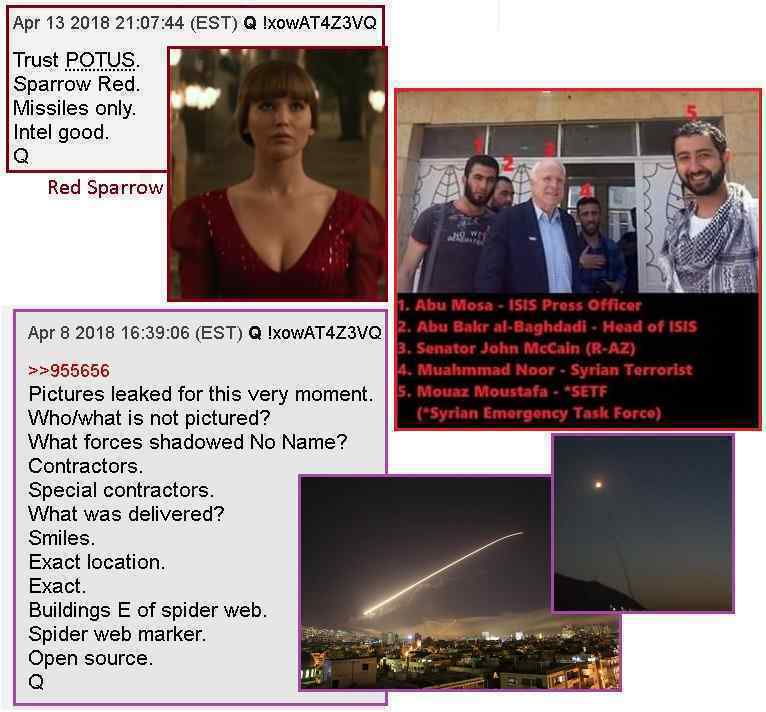 The Deep State was drained, and war in the Middle East averted. Syria comes under military attack on Trump's orders, 13 missiles shot down. Multiple places in Syria have come under attack by US, British and French military forces after President Donald Trump ordered a military strike against the country despite international warnings against further escalation of the situation. Syrian air defense units were scrambled to thwart the aerial invasion, intercepting 71 out of 103 of the missiles, the Russian Ministry of Defense said. The timing of the American-British-French attack is noteworthy. It came just hours before the UN's Organization for the Prohibition of Chemical Weapons (OPCW) experts were set to visit the Damascus suburb of Douma on Saturday to establish whether chemical weapons had been used there last week. ZetaTalk Insight 4/30/2018: Who released poison gas in Syria and why did the US finally rain missiles down on chemical depots in Syria? The UK’s PM May had her doubts about who was responsible. Even Defense Secretary General Mattis said he was not sure. But John McCain, who supports the anti-Assad rebels in Syria and visited them just days before the chemical attack, supposedly to deliver medical supplies for his wife’s charity, has no doubts. McCain, as suspected by many, did indeed deliver the poison gas supplies, and the bombing days later by the US, UK, and France were to wipe out the remaining poison depots. The public will not learn the full truth of this matter, except from the enigmatic Q who has become immensely popular on the Internet, and even gets a mention in the major media from time to time. As we have stated all along, Russia and Trump and his Junta are not adversaries but partners, meeting frequently. It was a Russian double agent that helped the US and their allies pinpoint McCain’s locations. McCain was already under surveillance and had been under House Arrest but was released so he would lead the authorities to his cronies. Will he and the Cabal trying to incite World War III succeed? This war between the Bush/Clinton/Soros/Netanyahu Cabal and the forces of good is in the final, intense battles. Unlike Fukushima, which was a nuke causing a massive Japan earthquake and tsunami, the attempt to nuke Hawaii failed. The attempt to incite a war with N Korea, despite all the nuclear material both the Bush and Clinton administrations had provided to N Korea in the past, failed. The Cabal still wants to impeach Trump and counter the 2nd Amendment and start World War III, but they are failing on all fronts. Meanwhile, another attempt to demonize Russia has failed, though the public is unlikely to learn of this in the major media. On March 4th, in the UK, a former Russian double agent, who spied both for Russia and the UK, was poisoned. This was detailed in Issue 599 of this Newsletter. At the time, Prime Minister May in the UK loudly claimed Russia had done it, with a nerve gas manufactured in Russia. This nerve gas is also manufactured in the US and the UK, and in that Skripal was associated with the Steele Dossier financed by Hillary to frame Trump, it is more likely his attempted assassination was to silence him re this. Now the Swiss have examined the nerve gas used to poison Skripal and as expected, declared it was not from Russia but from US or UK labs! This begs the question – why is Russia always being demonized? Russia is blamed for upsetting the US 2016 election, via collusion with Trump, but no collusion can be found. 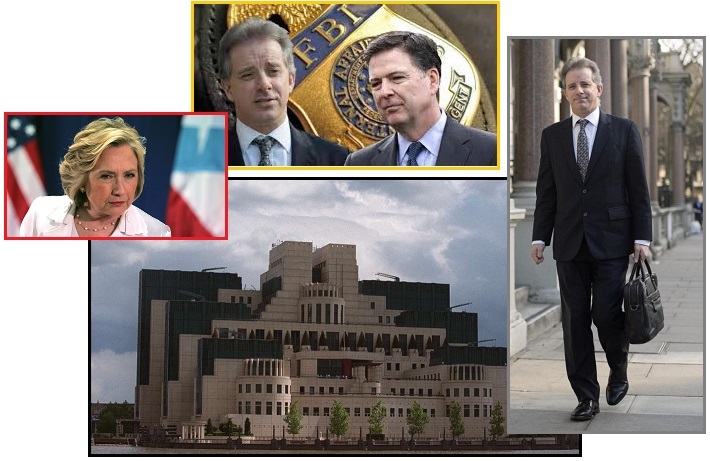 Instead, Hillary paid millions to finance the Russian Dossier with the UK’s Steele, so Hillary was guilty of Russian collusion. 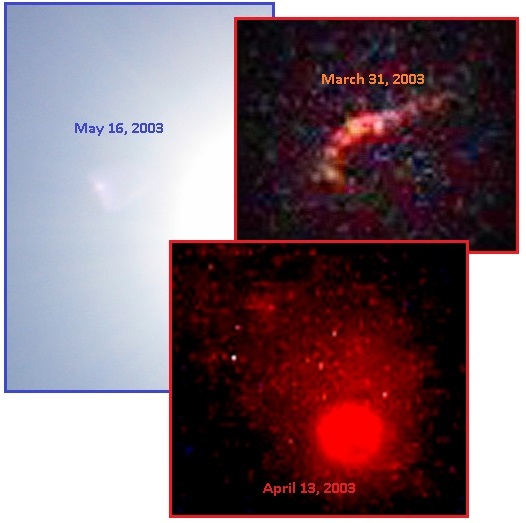 Per the Zetas, it is because the truth about Nibiru is likely to emerge from Russia, and the Queen and the Hillary Cabal are firmly opposed to this truth. According to the independent Swiss state Spiez lab, the substance used on Sergei Skripal was an agent called BZ, which was never produced in Russia, but was in service in the US, UK, and other NATO states. A Swiss chemical lab that worked with the samples that London handed over to the Organisation for the Prohibition of the Chemical Weapons (OPCW), that Sergei Skripal, a former Russian double agent, and his daughter Yulia were poisoned with an incapacitating toxin known as 3-Quinuclidinyl benzilate or BZ. ZetaTalk Insight 4/30/2018: But primarily Russia is demonized in the western media because the truth about Nibiru is coming from Russia, and the West has led the cover-up over Nibiru. That Putin has succeeded in his determination to empower the people of Earth with the truth is a testament to his political skills. Howling, grinding, roaring, moaning. These sounds coming from the Earth have been heard the past few years, since Nibiru arrived in the inner Solar System. These sounds seemed to start in 2011 with the Trumpets of Kiev, and per the Zetas caused by vibrating water caused by tension in the rock underneath. In almost all cases, they occur near water. The Trumpets of Kiev quickly moved to the horns of Belarus and a howling Tampa Bay in Florida. 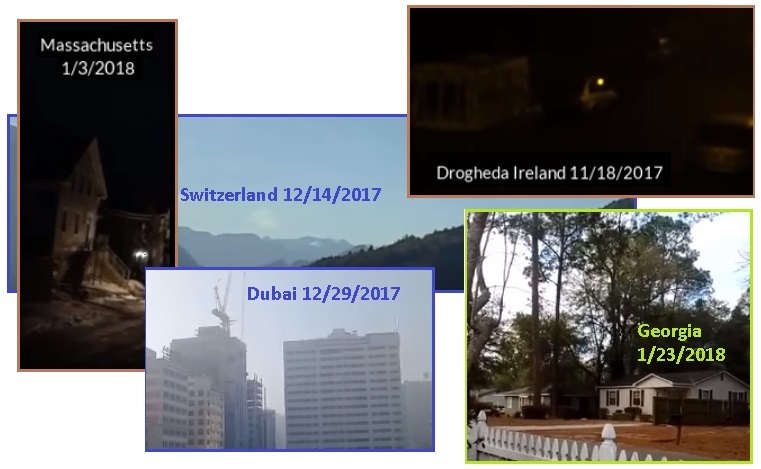 A video documenting these sounds occurring as recently as 6 months ago, from the US and Europe, shows how common they have become. Now trumpets have been heard in Hawaii too. ZetaTalk Explanation 8/28/2011: As we explained for the Kiev trumpets, when an enclosed body of water rests on vibrating ground, music can be produced. But the variety of sounds that vibrating ground can produce in a stretch zone is not always musical. The fact that the ground is vibrating is reported by witnesses, who state they can feel the vibration in the ground. Yet the official explanation, at a loss to explain the current Earth changes, involves the atmosphere. Somehow, it is the wind. In Kiev the reservoir dam amplified the vibrations, so the reservoir was singing. But where a broad expanse of ground is vibrating, such as the Florida recordings indicate, so many tones are produced that the result is a howl. Whether the sound is a tone, a rumble, a howl, or a hum the etiology is all the same - the ground is vibrating.